Employees who “blow the whistle” on conduct prohibited by a specific law and/or conduct that may cause damage to public safety, waste tax dollars, or violate public trust in the government may be protected against retaliation and may even qualify for a “bounty” under certain circumstances. 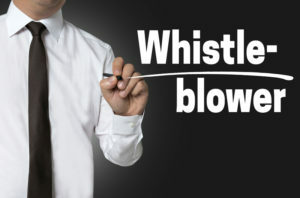 There are many state and federal laws that protect whistleblowers and some require that legal action be taken very quickly to provide protection. Lynn Pundzak won a jury trial against one of the biggest law firms in Cincinnati, and recovered lost wages and punitive damages for a whistleblower who was fired in retaliation for complaining about his employer taking advantage of a 93-year-old investor. In Rhinehimer v. U.S. Bancorp Investments, Inc., a jury in federal court in Northern Kentucky found that U.S. Bancorp (U.S. Bank’s investment arm) violated the Sarbanes-Oxley Act’s anti-retaliation provisions when it fired a financial advisor for reporting what he felt were unsuitable investments another financial advisor had recommended to an elderly client. A federal appeals court upheld the jury verdict on appeal and clarified that a Sarbanes-Oxley whistleblower is protected if he has a reasonable belief that securities laws were violated and reports that belief. He need not prove that the laws were indeed violated. This was one of the first jury trials in the nation involving the Sarbanes-Oxley whistleblower protection provision. Here are some of the federal laws with provisions protecting whistleblowers. If you are employed in any industry affected by these laws, or operate a business subject to these laws, the anti-retaliation provisions might impact you. Your claims under several of these provisions must be brought in a very short period of time – some as short as 30 days. Clean Air Act (CAA) – the comprehensive federal law that regulates air emissions from stationary and mobile sources. Commercial Motor Vehicle Safety Act (CMVSA) – which establishes uniform standards for testing and licensing of operators of commercial motor vehicles. Comprehensive Environmental Response Compensation and Liability Act of 1980 (CERCLA) – which provides a Federal “Superfund” to clean up uncontrolled or abandoned hazardous-waste sites as well as accidents, spills, and other emergency releases of pollutants and contaminants into the environment. Department of Defense Authorization Act of 1987 – the federal law that specifies the budget and expenditures of the United States Department of Defense and regulates defense contractors. Dodd-Frank Wall Street Reform and Consumer Protection Act (Dodd-Frank Act) – a massive piece of financial reform legislation which creates several new whistleblower protections for individuals employed in the financial services industry. Energy Reorganization Act of 1974 (ERA) – which establishes the Nuclear Regulatory Commission, which is responsible for the licensing and regulation of the nuclear industry. Fair Labor Standards Act of 1938 (FLSA) – the FLSA sets minimum wage, overtime pay, recordkeeping, and youth employment standards affecting employees in the private sector and in Federal, State, and local governments. FDA Food Safety Modernization Act (FDA Modernization Act) – the law that regulates of food, drugs, devices, and biological products. Federal Mine Safety and Health Act (FMSHA) – The Mine Act regulates coal and other mines to insure miner safety and health. Federal Water Pollution Control Act of 1972 (FWPCA) – also known as the Clean Water Act, it is the primary federal law in the United States governing water pollution. Longshore and Harbor Workers’ Compensation Act (LHWCA) – is the statutory workers’ compensation scheme that covers certain maritime workers, including most dock workers and maritime workers not otherwise covered by the Merchant Marine Act. Migrant and Seasonal Agricultural Worker Protection Act (MSAWPA) – which protects migrant and seasonal farm workers. Occupational Safety and Health Act of 1970 (OSHA) – OSHA is the primary federal law which governs occupational health and safety in the private sector and federal government in the United States. Its main goal is to ensure that employers provide employees with an environment free from recognized hazards, such as exposure to toxic chemicals, excessive noise levels, mechanical dangers, heat or cold stress, or unsanitary conditions. Safe Drinking Water Act (SDWA) – is the principal federal law in the United States intended to ensure safe drinking water for the public. Pursuant to the act, the Environmental Protection Agency (EPA) is required to set standards for drinking water quality and oversee all states, localities, and water suppliers who implement these standards. Sarbanes-Oxley Act of 2002 (SOX) – SOX protects shareholders and the general public from accounting errors and fraudulent practices in many different businesses, and also improves the accuracy of corporate disclosures. Solid Waste Disposal Act (SWDA) – an act that regulates the treatment, storage, or disposal of solid, both non-hazardous and hazardous, waste. Surface Mining Control and Reclamation Act (SMCRA) – the primary federal law that regulates the environmental effects of coal mining in the United States. Toxic Substances Control Act (TSCA) – provides the EPA with authority to impose reporting, record-keeping and testing requirements, and restrictions relating to chemical substances and/or mixtures. Certain substances are generally excluded from TSCA, including, among others, food, drugs, cosmetics and pesticides. Whistleblower Protection Act (WPA) – is a United States federal law that protects federal whistleblowers who work for the government and report agency misconduct. These are not all of the federal laws that protect whistleblowers. You need experienced counsel to determine whether your activities, or the activities of your employee, are protected. Ohio has a whistleblower protection act that might apply, even if no other law is relevant. Reporting criminal violations of four Ohio laws: Air Pollution Control laws, Solid and Hazardous Wastes laws, Safe Drinking Water laws, or Water Pollution Control laws. An employee may not be retaliated against for notifying, either orally or in writing, an appropriate public official or agency. An employee is not required to inform his/her employer of the violation. Reporting suspected criminal offenses that the employee reasonably believes are likely to cause an imminent risk of physical harm to humans or produce a hazard to the public health/safety. To receive protection, the employee must first notify a supervisor or other responsible officer of the suspected criminal offense. This report must be made in writing. The employer then has 24 hours to correct the violation and inform the employee of the correction. If the employer does not correct the violation, the employee may file a written report with an appropriate public official or agency. Reporting suspected felonies. If an employee becomes aware of criminal violations of any state, federal, or local law (other than the four types of laws listed above) and the employee reasonably believes that the conduct is a felony, the employee may not be retaliated against for notifying the appropriate officials. To receive protection, the employee must first notify a supervisor or other responsible officer of the suspected felony. This report must be made in writing. The employer then has 24 hours to correct the violation and inform of the employee of the correction. If the employer does not correct the violation, the employee may file a written report with an appropriate public official or agency. Reporting a co-worker’s criminal activities. If an employee learns of a co-worker’s conduct that either violates the law or is against company policy, reporting these violations may be protected if the following conditions are satisfied. The employee must reasonably believe that the co-worker’s conduct is either (1) a criminal offense that is likely to cause an imminent risk of physical harm to persons, or produce a hazard to public health or safety, or (2) a felony. The employee must first notify a supervisor or other responsible officer. This report must be made in writing. Whistleblower claims are on the rise. Contact the Pundzak Law Office at 513-564-9999 to learn how to protect yourself or your business.